It can happen so unsuspectingly: A quick-to-boil, disgruntled employee; An impulsive, disenchanted patient; And a simple phone call to OSHA. One overlooked OSHA protocol– that leads to another– and then a third (as in this case). The loose ends added up quickly when the OSHA Inspector began measuring this tally! A Compliance Audit, like this one,… can quickly precipitate disaster for the dental office, unaware of new changes in: Infection Control , Required Waste & Recycling Containers & Dental Chair Unit Water Quality Regulations. Oversights may be seemingly innocent: “We didn’t know that rules had changed”, “We are only a few months past-due for our OSHA Training Course” & “We just were not paying attention.” Comments like these, should never be uttered by dental personnel nor touch an OSHA Inspectors ears. The Penalties Inflation Adjustment Improvement Act of 2015 established an “Allowable Increase Rule” that lets these agencies adjust their assessed penalty levels, upward, every year. And they do just that! Since 2015, it seems OSHA & the DOL slap-on an average 10% increase to exceed the prior year’s average penalty rates. This year, the OSHA penalties will start at $13,260 per violation. 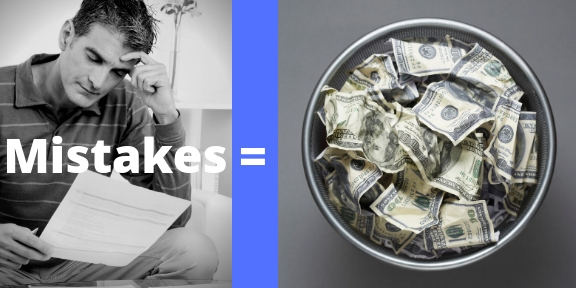 In addition, the maximum penalty allowed for “failure-to-abate” violations are $13,260 – that’s for every day that an employer fails to abate (1) specific violation! Finally, the maximum penalty allowed for “willful or repeated” violations is $132,598! This is 10 times the maximum permitted for “serious” & other-than-serious” violations. These fees, undeniably, would be astounding and threatening to any dental practice. Incorporate Annual OSHA Employee Training for all employees. Be sure to include full-timers & part-timers; clinical as well as non-clinical employees. Currently there are (45) Required OSHA Learning Point that should be covered in this year’s Annual OSHA Training. Apply what you learn in your facility! There are over 100 protocols to set up within your facility. Set your plan into action! Its best to work with compliance trainers that provide a “recap” of your training in report format. Then make sure you can reach your Trainers for additional guidance, clarification and support as you set up your protocols. Getting the assistance during your set-up phase will be a critical key to your success. Don’t forget the paperwork! OSHA inspectors will check for required OSHA documents first! 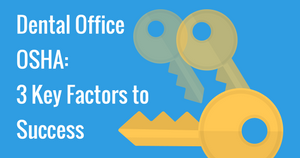 When entering your office, they will want to see required documents, that are up-to-date. Be sure to include: Employee Forms & Acknowledgements, OSHA Manual written to GHS & Current CDC Infection Control Standards & new OSHA / GHS SDS Sheets in (2) varying formats. What do you do now? : Get compressively compliant–then stay comprehensively compliant! How? Align with a compliance resource that provides “a relationship” along with your training, manuals, forms & protocol checklists. One that you can reach out to 24/7 for guidance, clarification and updates. We suggest this ALL IN ONE DXL Program. It provides everything, plus, 24/7 access to Dental OSHA & HIPAA Coaches that become part of your team’s success. It the relationship package. And one of the best rated in the industry. Need more guidance? Contact an OSHA / HIPAA Coach for a confidential Discovery Meeting by calling 941-587-2864 or email us, anytime. We are happy to help! Why the concern over these (2) elements? Over multiple year studies, dental labs have been found to have a higher occurrence of lung cancers and heavy metal poisoning, not only in the employees but also their family members at home. 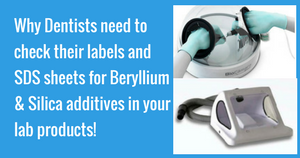 The tasks that are associated with this increased risk of beryllium and silicate exposure are casting, sandblasting, grinding porcelain, and cleaning/maintenance processes. The main culprit is the tasks is the materials used, they contain beryllium and silica dust. The particles are 1000x smaller than a grain of sand, allowing for them to become airborne and inhaled very easily. Poor ventilation, respiratory protection, and barrier PPE increase the risk of inhalation. This fine particulate dust also settles on our uniforms, which if brought home, is then inhaled by family members. This significantly increases our family member’s potential to develop respiratory issues, cancers, and chronic health issues. OSHA has implemented regulations that are aimed at protecting dental lab employees and the secondary exposure victims. These regulations are coming under stricter enforcement measures within dental labs and adjacent dental practices. For more information on this please visit https://www.osha.gov/SLTC/beryllium/index.html, this outlines the OSHA findings to include how family members are affected by respirable silica and beryllium dust. The time is NOW, to begin implementing programs to reduce or eliminate exposures! You can be sure that dental practices and labs (that have exposure potential) will be audited very heavily. Primarily because these issues not only affect those directly involved but also second-hand exposures are very likely as well. An excellent resource that breaks this down even further is at http://news.nilfiskcfm.com/2016/08/silica-dust-glance-answers-7-faq-oshas-new-rule/. Without proper respiratory protection, the particles are inhaled into the lungs where they cause scar tissue to build up, reducing the lung’s ability to function. This is a condition known as Silicosis and along with chronic heavy metal exposure and poisoning (from the beryllium used in the materials). This condition can lead to kidney damage, lung cancer, and tuberculosis. Silicosis is an incurable disease that will cause chronic respiratory issues for life. Even if the exposure is stopped, Silicosis can, and usually does get worse. Silicosis is a preventable condition through the use of exposure controls, ventilation systems, and appropriate PPE. How do we protect ourselves in regards to silicates and beryllium? The most effective method of control is through substitution. If we can eliminate materials that contain crystalline silicates and beryllium for sandblasting, then the main source of silicosis will no longer be present. A common replacement is aluminum oxide, however, there are many acceptable replacements available. If substitution is an option or not, focusing on ventilation at the production source of grinding is always a good idea. And this is a Best Practice when crystalline silicates and beryllium are in use. With an effective ventilation system in place, any dust that becomes airborne is evacuated before it is inhaled or caught on surfaces. In addition to appropriate ventilation, respirators are also required in case any stray dust is not captured. Respirators require proper FIT testing programs to be in place, either by a qualified member of the team or outsourced to a third party (approved testing methods are outlined by OSHA at https://www.osha.gov/laws-regs/federalregister/2003-06-06-0 ). At a minimum, the filters on properly fitting air-purifying respirators must be N-100 type as defined in CFR 42 Part 84.179. In addition to the above control methods, some specific housekeeping procedures will help reduce the chances of exposure. Wet mopping ( with disposable mop-heads), wet wiping, or vacuuming with a HEPA filter is highly recommended to keep dust from becoming airborne. DO NOT use a compressed air duster, this will significantly increase the airborne particulates in both quantity and trajectory. Always be sure to double-bag disposable-mop heads and wet wipes into sealed plastic zip-lock bags and dispose of this waste in an exterior trash container. When these items dry, the particulate matter can be reintroduced into the air. Best to get them isolated and taken outside of the workplace. Most importantly, we can help to ensure all members of our dental teams, and their families, have a safe work environment and continued quality of life. Dental office OSHA and HIPAA – WHAT’S REQUIRED? If you don’t know the answer to this question, you are in for a surprise! You are not the only one in the dark regarding compliance deadlines when it comes to OSHA and HIPAA. Let us enlighten you. Let’s begin at the beginning! Annual OSHA Employee Training is required for Federal OSHA compliance, this you may already know. In addition to that, there was an International Chemical Safety Module added last year called The Global Harmonization System Law (GHS). It is in fact, is a completely separate training requirement from Annual OSHA Employee Training. Not to worry, don’t be overwhelmed, help is available. There are easy, affordable options to help you achieve the GHS training requirement. Selecting the right training program is key! You want a comprehensive, yet simple program (with hand-holding if necessary). Be sure you choose a company that will walk you through the process and provides outstanding service as well. If that isn’t enough to make your head spin, there’s more! HIPAA has completely changed as of last year. The new protocols are called HIPAA Omnibus Rule. All training and implementation of new protocols were due in place by September 23, 2013. Dental offices now need to be compliant to the Omnibus Rules. 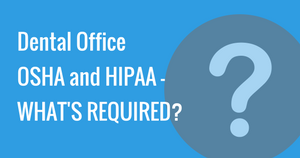 This involves employee training and new patient forms, as well as a new HIPAA manual written to the new Omnibus Rule Standard. Again, choosing a user-friendly compliance training program is key! Choosing a compliance company that will walk you through this process, provide ready-to-use forms and easy-to-understand training is paramount. HIPAA compliance is very complex and overwhelming on its own. Don’t try to navigate this slippery slope on your own, help is only a phone call away! For a free HIPAA consultation for your dental office, call 941-587-2864. 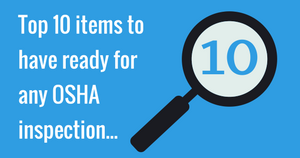 Not sure if you are aware but many States are hiring additional OSHA Inspectors for more penetration into the workplace. Dental Offices are especially being profiled. So much for poking a little fun at the regulations. Seriously, many dental offices do not know where unsafe behavior starts and where compliance begins! Don’t be caught unprepared or looking uneducated. Saying that you are unaware of the laws will only infuriate most OSHA Inspectors. Make sure you choose an OSHA Compliance Training Company that will help you get all regulations in place. Choose one that will help you with understanding the laws, implementing all of the requirements and that is available for direct questions you may have when putting your protocols in place. 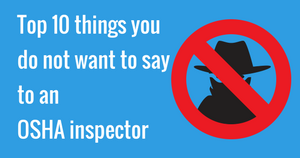 Say what you need to say to Mr. OSHA Inspector, but say it with confidence and conviction. Written by Jill Obrochta & Heather Whitt of Dental Enhancements. As of December 1, 2013, an additional module to OSHA called The Global Harmonization System (GHS) requires additional training and paperwork for all of your employees. GHS is an international chemical safety program. GHS Certification is now a required part of your OSHA paperwork. Also, all employees should sign forms with their risk of occupational exposures categorized, and rated by professional position. OSHA manuals are also due to be updated, and written to GHS Standard. Are you confused, maybe a little intimidated? You want to do the right thing, but where do you turn? Rather than try to figure out and find the paperwork yourself, finding a reliable, knowledgeable OSHA compliance company will take the burden off of you completely. 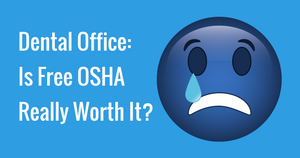 This one decision in hiring the right OSHA experts can be the single, most important decision you can make regarding your offices’ OSHA compliance. You’ll want to look for a company that can supply all forms and training needs so you can do what you do best, dentistry! All of the Dental Enhancements products and services come with guided attention from one of our OSHA/GHS experts and you get all necessary forms customized for your team and in electronic format. (Microsoft Word and PDF). Paperwork: you either have too much or can get caught with not having enough. Don’t risk it! Call Dental Enhancements and get on the right paper trail! 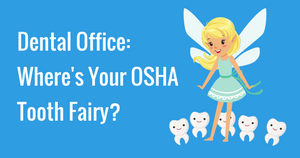 Dental Office: Where’s Your OSHA Tooth Fairy? 1. Comprehensive Is Key! : In 2013 OSHA compliance mandated that dental offices begin to implement the Global Harmonization System (GHS). By December 1, 2013 it was required that all employees be trained to this GHS-Standard. Proof of this training is also required. Your OSHA Manual will also need to be updated to this new GHS standard. 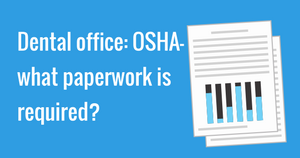 Finally, your required OSHA Employee Paperwork needs to be updated too. Don’t feel overwhelmed or discouraged. Simply choose a comprehensive GHS training solution. This one seems to be written by the tooth fairy herself. It’s logical and stress-free! 3. Are You Up-to-Date? There is no excuse for non-compliance, And “not knowing” is not a good answer! GHS Standards will undoubtedly change and update. Stay in-touch with a compliance company that will provide comprehensive yet easy-to-understand compliance updates. Choose an OSHA Compliance Training Company that will share updates with you throughout the year and provide an interactive relationship. You will gain comfort, confidence, and peace-of-mind. Remember these (3) factors are the key to your OSHA compliance success. The OSHA Tooth Fairy is out there. Call her at 941-587-2864. Written by Jill Obrochta RDH BS & Heather Whitt EFDA of Dental Enhancements. 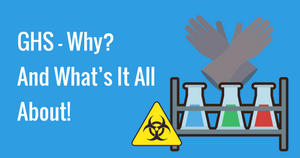 There is an old adage: “You don’t know, what you don’t know”…And you may not know: Federal OSHA law mandates that you have an additional training module added to your list of OSHA requirements that deal with “international chemical safety in the workplace”. The fancy name for this is Global Harmonization System (GHS) and it was required for all employees (full-time, part-time and even receptionists) as of December 1, 2013. GHS is the result of the Earth Summit, a meeting of international minds to help standardize chemical safety guidelines for all workplaces around the world. The GHS Standard is new to the USA but has been in full operation in Europe, Canada and several United Nations for the past 8 years. It deals with making the Material Safety Data Sheets (MSDS) of the USA to a standardized format, called Safety Data Sheets (SDS). These are to be hosted in a cloud library for easy access by all employees. The requirement is 24-hour access in case of a reaction to chemicals previously used in the workplace. Additionally, the Hazard Rating Labels of the USA turn into “pictograms”. Small universal symbols that convey chemical dangers when handling substances at work. You will also want to have ongoing communication with their OSHA experts. Our favorite program is the Initial Annual OSHA Employee Training Package or the All in One OSHA Training Package. Don’t be caught unprepared, make sure your training company has your back. We’ve all been there: The Supply Rep brings in a decadent sandwich tray, you are eyeing the chocolate chip cookies, wondering if it’s worth the indulgence. Then you decide, you really must munch on something sweet just to tolerate the next 45 minutes of OSHA yammering! Is the free lunchtime OSHA really worth it? A proper OSHA Training Session requires you review and fully understand up to (23) areas of compliance. Make sure you have a certificate that references all 23 areas and that all employees sign off on this. There are (5) required forms for each employee to fill out. Make sure your receptionists and part-timers are included in this paper fiasco too. Everyone must comply. Choose a compliance company that has expertise in all OSHA regulations for the dental office. One that can offer a customized facility report for your office then help you get the recommendations into place. Creating an OSHA Compliance Program for your dental office can be a daunting task. If the thought of implementing or updating your OSHA program makes you cringe, want to pull your hair out or quit your job….Hang-in there, there’s help! 1. Be Sure your Program is Comprehensive: In the recent year, there were sweeping changes with regards to OSHA compliance. In 2013, OSHA mandated that dental offices begin to implement the Global Harmonization System (GHS). This means that by December 1, 2013 you should have at least had your team trained to the GHS-Standard and be able to show proof of this training. OSHA manuals will need to be updated to the GHS standard as well as your employee paperwork. Proof-of-GHS-Training is a requirement, so you will want to have a GHS-Certificate or its equivalent. Make sure to choose a comprehensive GHS training solution. It will make your life with this new protocol logical and less stressed! Remember these (3) factors are the key to your OSHA compliance success. Don’t be fooled, it’s not that easy. Go search-out your OSHA Tooth Fairy now!